Our connection to water – most notably the Mississippi River – is one of the reasons Saint Paul is a livable, vibrant city, and we understand the need to protect this natural resource for future generations. We are always looking at ways to harness the power and significance of water resources in our communities. One of the ways we are doing this is through viewing rain as a resource, not a waste product that gets sent to the river through our stormwater drains and pipes. Looking at stormwater management in new ways is essential the future of any thriving city, and Saint Paul is at the forefront, ready to implement new sustainable strategies. What is Saint Paul doing? Saint Paul has experienced tremendous growth in recent years, and several new projects are on the horizon. As explore new developments, we continue to be innovative in how we look at stormwater treatment and seek cooperative public-private partnerships that add value by investing in this infrastructure as a public amenity. Rain can be a valuable resource to create vibrant community-building amenities such as green space and water features for all residents and visitors to enjoy. Saint Paul has been a leader in implementing innovative stormwater management solutions for several years. While the completed projects have involved public ownerships, the City is now working with developers to incorporate these practices into private redevelopment sites. We need to develop a financing mechanism to pay for upfront construction costs and ongoing maintenance costs in a way that spreads costs equitably between current and future users. In 2016, Saint Paul was selected to join the City Accelerator Infrastructure Finance cohort, through Living Cities and the Citi Foundation. The 18-month program is designed to bring cross-departmental teams together to develop cutting-edge financing initiatives for capital projects. Saint Paul is focusing on a developing a replicable funding and financial model for innovative stormwater infrastructure. The master plan for West Side Flats, a 40-acre brownfield site just across the Mississippi River from downtown, proposes creating a scenic greenway that would serve as both stormwater infrastructure and public open space. 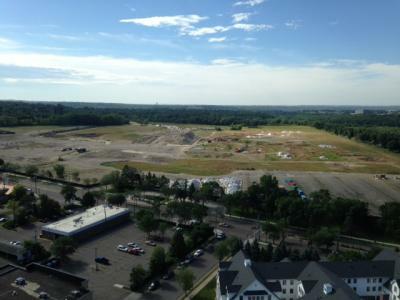 The 1,450-foot, six-acre greenway of plants and trees irrigated by stormwater would snake through the development. The greenway would help clean and filter the water before it is conveyed into the Mississippi River. 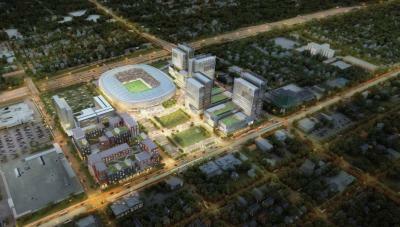 The Snelling-Midway development, which includes a new professional soccer stadium and the coordinated redevelopment of the nearby Midway Shopping Center, provides opportunities to incorporate shared rainwater treatment features as amenities for the new urban village. The soccer franchise and owner of the remaining superblock commercial property have both expressed willingness to explore a shared stormwater treatment system for the entire 34.5-acre site. City staff recently led a half-day workshop with the development team to collaborate on possible designs. Broadly recognized as one of the best urban redevelopment opportunities in the country, the 135-acre Ford Site redevelopment will provide opportunities to integrate innovative stormwater management features into residential and commercial developments. Stormwater runoff from the former Ford site drains to one point: Hidden Falls Creek, which flows to the nearby Mississippi River. Historic maps indicate the creek existed on the site prior to the assembly plant but was paved over and buried. The high amount of impervious material at the Ford Site sends uncontrolled runoff downstream without treatment into the river. For almost a century, the creek has been ravaged by extreme flows during rains while stagnating in dry periods. Our goal is to re-create the historic water feature on the site, fully naturalize the existing downstream creek, and reconnect the future neighborhood to the river by means of open water flow path. This prominent water feature will run through the site from north to south, serving both as a public amenity and as a forward-thinking stormwater management system. CHS Field, the new ballpark in downtown Saint Paul, features the first municipal rainwater harvesting and reuse system in the state. 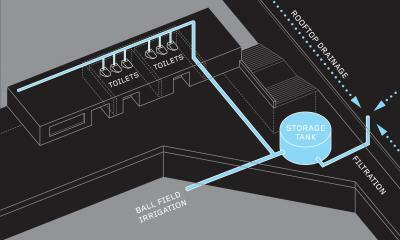 Rainwater is captured from the roof of an adjacent building, filtered, and used to irrigate the playing field and flush some of the toilets and urinals in the ballpark. Overall, the process is expected to generate 86,000 flushes per year (10 percent of the ballpark’s total flushes) and save $1,600 in water bills annually. 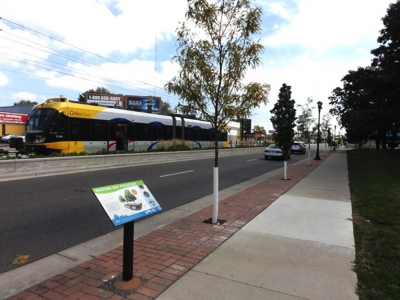 As a part of the Green Line light rail project, the City of Saint Paul and the Capitol Region Watershed District created the longest integrated tree trench system along University Avenue. The five-mile system treats runoff while irrigating 1,000 new trees in the urban corridor. The unique system allows excess water to infiltrate, preventing pollutants from reaching the Mississippi River. 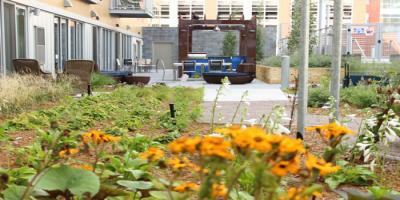 The Penfield, a mixed-use, 254-unit market-rate rental housing development in downtown Saint Paul, has a 12,000-square-foot green roof, which helps retain stormwater.